"Gourmet features at a reasonable price." "Does the job without a lot of frills." "Can cook steaks for dinner without taking a huge amount of counter space." "Small enough and affordable enough for home users." "Has a clear container, so you can see the food from the sides as well as the top." "Combines a smart hub that 'talks' to the proprietary 'smart tops' that are placed on it." 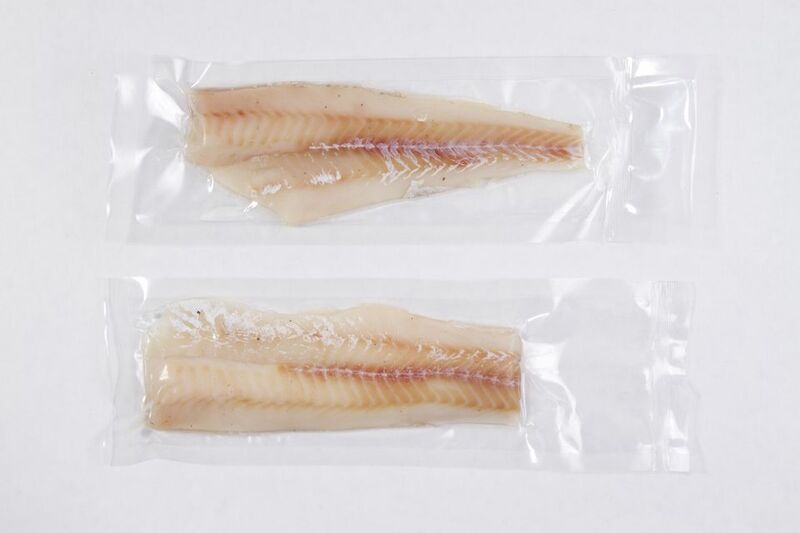 "Designed for both sous vide and slow cooking." 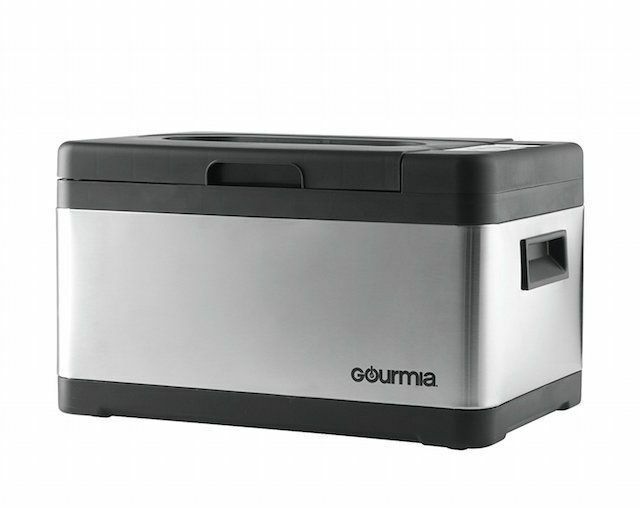 This 10-quart sous vide machine has gourmet features at a reasonable price. It uses a proprietary ACT (Active Control Thermostat) System which monitors the water temperature and automatically adjusts both circulation and temperature so the water temperature stays consistent throughout the container. The temperature can be set from 32 to 212 degrees – it won’t cool down to the lower temperatures but it can read those temperatures. If the thermometer goes out of calibration, it can be recalibrated. The timer can be set for up to 24 hours and the backlit display shows time and temperature. When the cooking time is complete, the temperature will remain the same for one hour while the machine beeps in one-minute increments for until you press the button to stop the cooking process. A rack is included to keep the food pouches separated during cooking. If you’re interested in trying sous vide cooking, but you don’t want to spend a lot of money, this 9-quart sous vide machine does the job without a lot of frills. It can hold the temperature from 115-195 degrees in increments of one degree, and the timer can be set for up to 72 hours. When cooking time is done, it turns off. The buttons that control time and temperature are simple to understand, and a digital display shows cooking time and temperature. This includes a pouch rack to keep the food separated during cooking, as well a kitchen tongs. It does not have a water circulator pump. When space is at a premium, this small-footprint machine can cook steaks for dinner without taking a huge amount of counter space. It holds 8.7 liters of water and weighs less than 10 pounds, so it’s easy to move out of the way or store when it’s not in use. Temperature can be set from 86 to 210 degrees in 1-degree increments and the timer can be set for up to 99 hours. Easy-to-understand buttons make it easy to set up, and a digital display shows the cooking time. This includes a food pouch rack to keep food separated during cooking. An audible beep indicates when time is up. The machine does not turn off automatically. Sous Vide Supreme is a brand that’s been making commercial sous vide equipment for some time, and was one of the first to come out with a model that was small enough and affordable enough for home users. This unit holds 11.2 liters of water and keeps the temperature steady at any temperature between 86 and 210 degrees, within 1 degree. Operation is simple with push buttons to set the time and temperature. A display shows the cooking time, and the timer can be set for any time up to 99 hours. This includes a food pouch rack to keep food separated during cooking. This sous vide has a clear container, so you can see the food from the sides as well as the top. The digital controls are easy to use and control the temperature to within 0.1 degrees, no matter how full the container is. The container is removable for easy cleaning and for adding or disposing the water. Since it only holds water, cleanup is simple – just wipe it with a soft cloth. Side handles make it easy to lift and move the container, and a removable lid holds heat in and minimizes evaporation. The container holds three gallons. A safety indicator warns if the power has been interrupted during cooking, which could cause the food to be unsafe to eat. There is a timer that tracks the cooking time once the proper temperature has been reached but it does not stop the cooking, so you’ll need to set a separate timer to let you know when cooking is done. This unique design combines a smart hub that “talks” to the proprietary “smart tops” that that are placed on it. The hub itself is an induction cooktop that can be used with any induction-ready cookware – it won’t talk to that cookware, however. Because it uses induction, it heats very rapidly and maintains that temperature with less energy expenditure than a stove would use. The temperature of the smart oven can be precisely controlled to within .01 degrees, but this does not have a water circulator pump. A spacer plate keeps food off the bottom of the pot to help with even heating and a food rack keeps the food in place and separated, if you’re cooking multiple items at the same time. This can also be used as a slow cooker. It holds 11 quarts. This sous vide bundle includes the hub, sous vide oven, spacer plate, and food rack. It also includes a vacuum sealer and accessories for the sealer: 3 quart bags, three gallon bags, wine and oil keeper, flexi tube, and zip disk. You can also purchase the hub and water oven without the vacuum sealer. Designed for both sous vide and slow cooking, this 6-quart cooker can be set from 104 to 210 degrees and can cook for up to 72 hours, but it does not circulate the water. The container is nonstick metal for easy cleanup when used as a slow cooker and it has a glass lid so you can peek at the food without losing cooking heat. The cooker will automatically switch to keep-warm when cooking time is done. The cooking container is removable for easy cleaning and filling. Large handles make the cooker easy to move. This has easy digital controls to set cooking mode for sous vide or slow cooking, as well as time, and temperature. A digital readout displays the time during cooking.